Since I didn’t really know when the previous owner did the last rear differential oil change I decided to do this quick 30 minute job last week. The Mercedes service interval for changing the differential oil is 120,000 miles (192,000 km). Changing the differential oil on a Sprinter is super easy: No need to lift the van, just crawl under it and open the drain plug with a 14 mm hex socket. You can figure out the drain plug location by looking at the picture below – the wrench is inserted in the drain plug on the right hand side of the differential. As usual when draining oil, make sure that you can remove the fill plug before removing the drain plug. Worst case the fill plug is rusted shut and you end up with an empty differential without a way to fill it again. Also clean the area around the plugs before you remove them otherwise you’ll might introduce dirt into the differential. 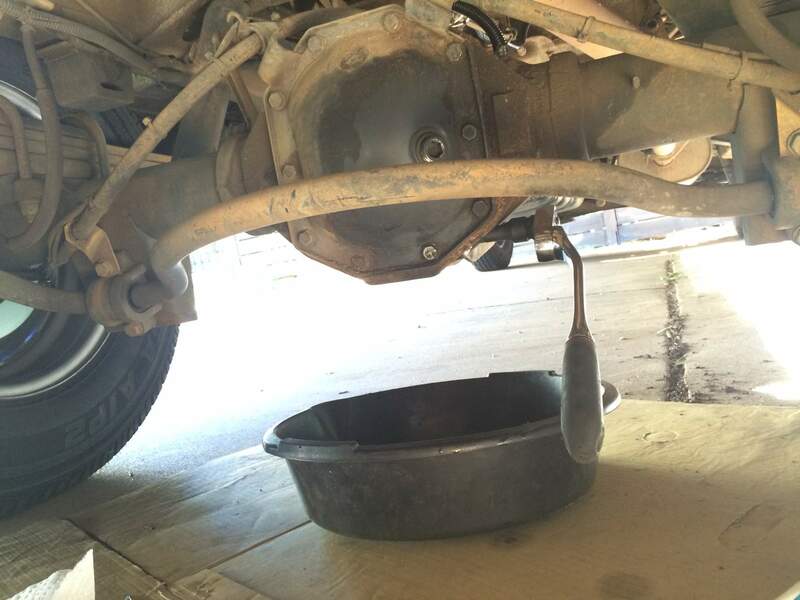 Drain the oil, close the drain plug again (torque is 100 Nm or 74 ft. lbs) and then fill in the fresh gear oil until it starts dripping out of the fill plug – assuming you park on level ground. You need somewhere between two and three quarts. Finally put the fill plug back in and tighten it with 100 Nm. The Sprinter manual requires Shell Spirax MB 90, MOPAR Part No. 05136033AA, or equivalent with the MB 235.0 spec. I’ve actually used what I had left from our other Mercedes cars: synthetic 75W90 from different brands. Time will tell if this was wise but I my quick google research said it’s ok to mix brands as long as the specification (75W90) is the same and they are all synthetic. If you’re more risk averse, read through the various threads on sprinter-source.com about the right type of gear oil for a differential oil change in a T1N Sprinter. “Never drain the oil before being sure you can get the fill plug out”. Hi, thanks for this. How do you pour new fluid in the fill port without spilling it? Thanks. most gear oil bottles come with some kind of filler hose/tube that allows you to get most of the oil out of the can and into the differential withouth much spilling. How much oil did you need?